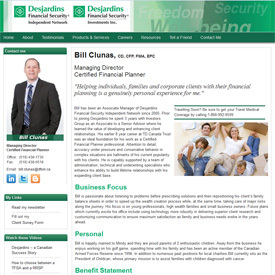 Are you a financial advisor or managing partner with Desjardins Financial Security Independent Network? 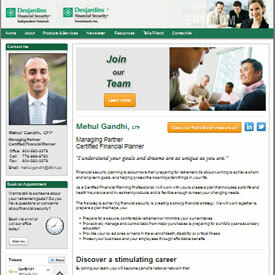 Please check out some of the sites we've launched for your colleagues. If you'd like to see more examples of our work, call Carla at 250-514-2208 or email sales@adedia.com any time. 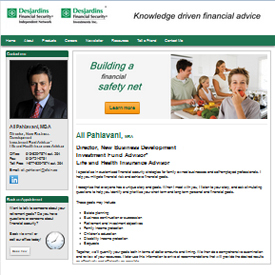 Our software is quite unique in that it allows us to customize site designs easily. If you like one of our designs but want to personalize it in some way - perhaps by applying a different colour scheme, by changing images, content, logos or sizes of graphics, let us know. Many customization requests fit within the boundaries of our package prices, so if you want something a little extra, let us know. Ask us about multi-lingual websites.